The other day we reviewed peacoats, but now we’re taking a look at topcoats, the peacoat’s bigger, older, more formal brother. While they can be, and these days very often are, worn with jeans and a sweater, they are first and foremost designed to be worn formally and with a suit. 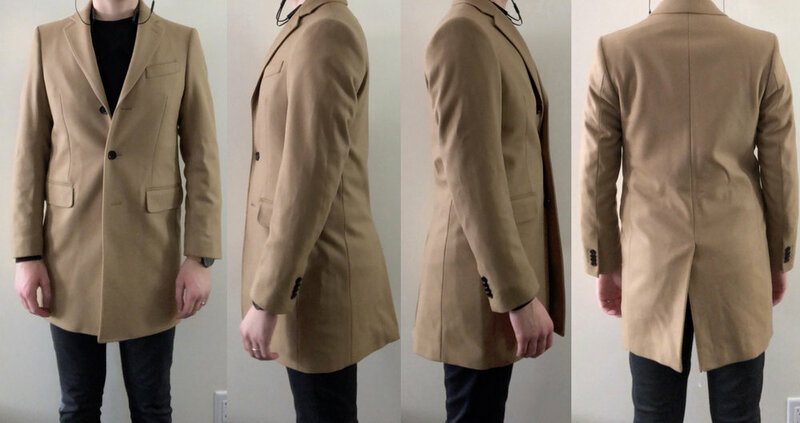 For this review we took a look at a camel topcoat from Banana Republic and a dark charcoal topcoat from SuitSupply. SuitSupply: It should be no shock that this thing is beautifully made. The 100% wool fabric is light, and flows, and drapes beautifully, and the whole coat wears with a silky smoothness that is a bit hard to describe. It also, despite it’s lightness, is the sort of coat that should keep you solidly warm during the winter. It’s fully lined, and while it’s not the right tool for the job if you’re going to be enduring blizzards, with a suit, sweater, and a scarf, this should be plenty as a top layer. Of course, the fabric itself has a fantastic texture, feels soft and cozy, even, and is a deep and rich charcoal grey that goes with absolutely everything. The front buttons are solid, weighty, and have a mini, interior button to which they are fastened to keep them even more secure. The sleeve buttons are functioning. In all, this is a very well made coat. Banana Republic: I was pleasantly surprised with the quality of this coat. The fabric makeup is 80% “virgin” wool and 20% nylon. It does not drape or feel nearly as elegant or smooth as the SuitSupply coat, but it’s still well made, and feels substantial when worn. It’s soft enough, and has a nice, minimal texture. It’s somewhat stiff-feeling when worn, but it’s not so bad as to really be of concern. It’s fully lined and I think will keep you just as warm as the SuitSupply coat, if not warmer, as it feels a bit heavier and less breathy (which, as you can see, is both good and bad). I think the light camel color of the jacket is great, the pick stitching around the edges is nice, and the buttons — while thinner and lighter and not as nice as the SuitSupply buttons — are also fastened to a mini interior button for security. Plus, the button holes are functioning as well (which is always a nice touch, though it does make hemming the sleeve more difficult as they cannot be moved up or down). Winner: SuitSupply has to take the edge here. I would not say that it is night-and-day, but it’s obviously the superior garment. SuitSupply: This coat features a 2-3 button roll on the front, much like many of SuitSupply’s suits. This can only be done with higher quality construction, really, and is a nice detail on nicer coats like this. What this means is that the coat is meant to be worn as a two-button coat, but has a third, functioning, hidden button as well. It’s mostly there for stylistic purposes, but can always be used it needed/wanted. While I love this detail on a suit, I do not much like it here on a topcoat. It makes the button stance almost comically low. While it doesn’t end up looking too bad when you are wearing a suit beneath it, something just looks very off when wearing it without a suit jacket beneath it. I just think the proportions are a bit strange here. The jacket also features wide, notch lapels which look great, as well as vertical side pockets to make slipping your hands in and out of them easier. Also, as mentioned above, I think the shade of grey is absolutely perfect for this coat. It makes it infinitely versatile as it is not too light as to be a bit edgy, but not to dark as to be intensely conservative. It’s really perfect. Banana Republic: While a camel colored coat is obviously a very different thing than a dark charcoal in terms of versatility (and should be a secondary coat, not a primary), it’s still very versatile. This jacket also features notch lapels, though they are not as wide as the SuitSupply coat. The pockets are also flap pockets, making it harder to get your hands in and out of. The front of the jacket just has 3 buttons, with no roll, and I think looks better proportionally than the SuitSupply coat. As stated above, as well, I like the pick stitching around the edge of the jacket. Winner: Banana Republic by a hair. Again, not at all night-and-day, but the 2-3 roll on the SuitSupply jacket really throws it off for me, and otherwise, these coats are basically neck and neck as far as style and design is concerned. Each has something going for it that the other lacks. SuitSupply: SuitSupply’s website claims this to be a slim fit coat. I ordered my usual 36 and while it is truly slim in the waist — if anything, it’s too tight in the waist — it’s as if SuitSupply entirely forgot to slim down the sleeves (something many companies seem to forget with their slim fits). Even wearing a sweater + a suit jacket, I could still pinch inches of extra fabric around the bicep area. While I am sure some guys have arms that big, most of us do not. The chest area fit just fine, but the waist tugged and pulled when buttoned over a suit jacket. Body length was perfect, though the sleeves were too short (a common problem I find with SuitSupply garments). Banana Republic: BR’s site is riddled with outerwear reviews claiming the sizing is all screwed up this season and is way larger than it should be. Since this has happened, BR has added to their outerwear product descriptions that if you prefer a slimmer fit, you should order one size down from your usual, so I ordered this coat in XS. Much like the SuitSupply coat, this fit a bit too snuggly in the waist, but had tons and tons of extra room in the sleeves. Why is it so hard to find sleeves that fit? Plus, unlike the SuitSupply coat, it fit rather boxy in the chest, and when worn unbuttoned looked like I was wearing a coat a size too big. As far as length is concerned, it is also fine, just like the SuitSupply coat, though perhaps a touch short, and the sleeves are a bit too short as well. Winner: SuitSupply by a smidge. Again, it’s only a slight edge here. I think it fits better in the chest and when unbuttoned, and is definitely cut in a slimmer, more tapered design overall. BR’s coat is a boxy fit, but when sized down, happens to fit a bit better. But it’s not actually a well-cut garment. 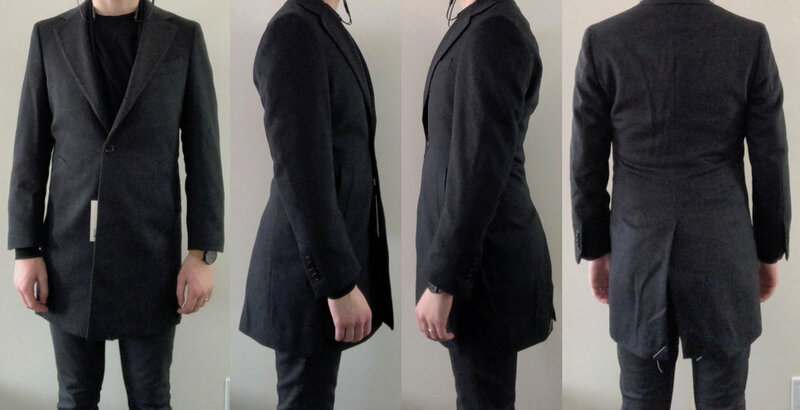 SuitSupply’s even if they need to tweak their arm measurements, is a well cut coat. SuitSupply: At $399, this is no small investment. SuitSupply offers free shipping both ways, and has a great return policy, so you’re going to want to put that to full use with this coat. It’s a great coat as far as quality and construction is concerned, and in that sense, this is a $400 coat, yes. The fit, though, could use some work, and you’ll have to see if it works for you. If you can afford it, and it fits, and you don’t mind the 2-3 button roll on your body type, this is a great, classy, coat that you really can’t go wrong with. Banana Republic: The retail price of $378 is robbery on the part of BR. However, they price their items with full knowledge of their perpetual 40% off (or higher) sales. Thus, this coat really sits at a far more reasonable $226 (or even less). For a coat that is also solidly made, has some nice detailing, but also suffers from some fit issues, I think this is the better value for most guys. Winner: Banana Republic. Look, if money is no object, then always go with the best thing you can afford, and that is for sure SuitSupply. It’s a better made garment, no question. As far as value is concerned, though, the BR coat more than does the job in just about every way, and is significantly less money. OVERALL WINNER: It’s a tie, here, folks. Depending on what aspects of a topcoat you most care about, you’re going to want to go with the coat that works best for you. In my opinion, I will be returning both these coats and continue my search. If you made me pick between the two, I would go with the BR coat and take it to my tailor. Let us know what you think, though!